Oh Hell! is based on taking tricks. During gameplay, players take turns putting a card face-up on the table. The person who plays the highest card wins and collects all the played cards — one trick. The winner of the trick plays the first card to start the next trick. The process continues until all the cards play out. Like in most games that involve taking tricks, the players in Oh Hell! score points for winning tricks. However, winning is more than just a matter of taking tricks. 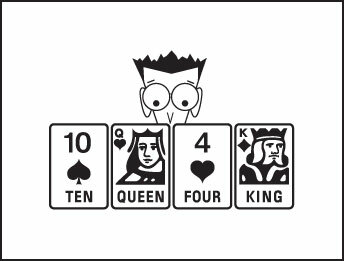 Before the actual play of the hand, you must estimate precisely how many tricks you think you’ll win in the hand. The importance of accurately predicting your trick total far outweighs the reward for actually winning tricks, so picking up a bad hand isn’t necessarily a problem. Indeed, a terrible hand may be easier to judge than a great one. Making accurate estimates about your hand determines your success at the game, which is a very satisfying ingredient for a card game. The dealer deals out every card in the deck, starting with the player on his left, as long as everyone gets the same number of cards. You deal the cards face-down. You put down the remaining cards and turn over the top card to determine the trump suit for that hand; the other undealt cards play no further part in the game. For a four-player game, in which all the cards go out, cut the deck to determine the trump suit before you deal out the first hand. After a hand ends and you tally the scores, the deal passes clockwise for the next hand, and that player deals out the cards. For the subsequent deal, however, you deal one fewer card to every player, and the reduction continues for each subsequent hand until each player receives only one card. Following the single-card hand, the number of cards goes up by one each hand. The sequence progresses until you reach the maximum again. The game ends after the second maximum hand, and the winner is the player who finishes with the highest total. You can also start with one card, work your way up to the maximum, and then come back down to one card. Either way works, and the variation you choose really doesn’t matter. If two players tie for the lead at the end of the game, the deal passes on, and everybody plays one more hand with the maximum number of cards. Additional deals with the maximum number of cards continue until you determine a winner. You must play a card in the suit led, or follow suit, if you can. If you don’t have a card in the suit led, you can play a card from the trump suit, which automatically wins the trick — unless an opponent plays a higher trump card. You can also let go (or discard) a card from any other suit — in which case you can’t win the trick. The smallest trump card beats even the ace of a side-suit (any non-trump suit). After you look at your hand, you swallow your pride and place a realistic bid. Your bid represents the number of tricks you intend to take during the course of the hand. The bidding starts with the player to the left of the dealer, who can bid any number of tricks that she likes up to the maximum, which is the number of cards received by each player. How much you bid depends on your high cards, your trump cards, and by what the other players bid around you. The more the players around you seem to be bidding, the less you should rate your hand to be worth — and vice versa. Additionally, if you can gauge that the players with good hands are to your immediate right (so you play after them and capture their honors), you may again up your bid by a trick. The bidding continues clockwise until it comes back to the dealer, who has the final bid. Nothing stops the players from bidding, as a group, for too many tricks or too few tricks, and any player can try for no tricks at all. Everyone but the dealer can bid for as many tricks as they think they can take, up to the number of cards dealt to each player. One of the little peculiarities of Oh Hell! that can lead to pleasurable aggravation (if you aren’t the unfortunate dealer) is that the total number of tricks the players are going to go for can’t equal the number of tricks available. For example, if five cards go to each person, the total number of tricks bid can’t be five; therefore, if the first three players bid 1, 2, and 1, respectively, the dealer can’t contract for one trick because doing so makes the total five. Why this stipulation, you ask? Allowing the number of tricks contracted for equal the number of tricks available presents the possibility that everyone could nail their bids — a situation that’s inherently unsatisfying. And the smaller the number of cards you deal, the more potentially arduous this rule can be, and on the round when only one card is dealt, it can produce particularly irritating results for the dealer, who bids last. The designated scorer writes down the bids on the score sheet as players call them out so he can check the accuracy of the bids afterwards and tell the dealer what bid (or call) is forbidden. If you make a bid out of turn, the bid stands, and the other players can take advantage of it by having more information. However, if the dealer makes a bid out of turn, it doesn’t stand because the disadvantage of bidding last must go to the dealer. Don’t bid too high; when in doubt, playing to lose a trick is generally much easier than playing to win it. A hand with plenty of potential — but no guarantees! Suppose that four people are playing, and you hold this hand as first to bid. If hearts are trump, you may, on a very good day, win all four tricks — you’re virtually certain to win at least one, if not two. The odds are in your favor; however, it may be smarter to bid two rather than three and then listen carefully to the rest of the bidding to determine your play strategy.